October 12, 2016 – Mars’ largest moon, Phobos, has captured public imagination and been shrouded in mystery for decades. But numerical simulations recently conducted at Lawrence Livermore National Laboratory (LLNL) have shed some light on the enigmatic satellite. 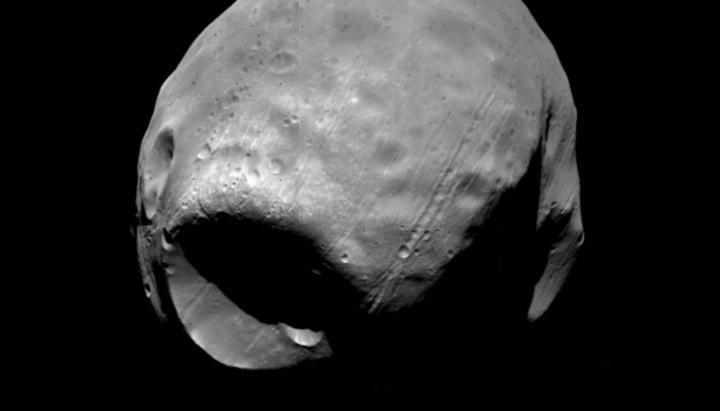 The dominant feature on the surface of Phobos (22-kilomters across) is Stickney crater (9-km across), a mega crater that spans nearly half the moon. The crater lends Phobos a physical resemblance to the planet-destroying Death Star in the film “Star Wars.” But over the decades, understanding the formation of such a massive crater has proven elusive for researchers. For the first time, physicists at LLNL have demonstrated how an asteroid or comet impact could have created Stickney crater without destroying Phobos completely. The research, which also debunks a theory regarding the moon’s mysterious grooved terrain, was published in Geophysical Review Letters. Previous studies used 2D simulations at lower resolutions, and they were ultimately unable to replicate Stickney crater successfully. Additionally, prior studies failed to account for the porosity of the Phobos’ crust in their calculations, critical given that Phobos is less dense than the Martian surface. The foundation this research is built upon is decades of investment in LLNL computational capabilities used to ensure the safety, security and effectiveness of the U.S. nuclear deterrent in the absence of nuclear testing – commonly known as stockpile stewardship. This research was also funded in part by the Laboratory Directed Research and Development Program at LLNL. The study was spearheaded by Jared Rovny, a summer student visiting from Yale University. Other co-authors include LLNL computational physicist Mike Owen, who supported the research by mentoring Rovny and aligning the study to benchmark the Spheral code, and Paul Miller, who leads the planetary defense team at LLNL. Syal conducted followup modeling to confirm the findings and wrote the published paper. She will give a talk on the paper in Pasadena this month during the annual meeting of the American Astronomical Society’s Division of Planetary Science.